Italian Aerospace Network (IAN) has attended the 4th Business Forum Italy-China, which is the most important bi-lateral event organized annually in Italy and in China since 2014. The 2017 Business Forum Edition, held in Beijing, was organized to celebrate the high-level meeting between Italy’s Republic President Sergio Mattarella and PRC President Xi Jingping. Over 250 Italian delegates attended the 4th Business Forum, representing 90 Italian enterprises. The Italian presence in China has widely developed in recent years and today the annual sales turnover of the 2.000 Italian enterprises based in China is over 5 billion euro. The 4th Business Forum Italy-China, hosted by China Chamber of Commerce for Import and Export of Machinery and Electronic Products (CCCME), Italian Trade Agency (ITA) and Confindustria, sponsored by Ministry of Commerce of the People’s Republic of China and Ministry of Economic Development of the Republic of Italy, was opened by Zhou Xiaoyan, Director of Ministry of Foreign Commerce of China who expressed the great efforts that the two countries are contributing to the development of the bi-lateral trade relationships and that today is represented by a trade exchange of US$ 43 billions. The Under-secretary of State of the Ministry of Economic Development of the Republic of Italy, On. Ivan Scalfarotto, presented the new program of industrial and commercial development (Industria 4.0) and invited China to “Do It With Italy” by using the advanced technologies developed through “Italy 4.0”. – Marco Tronchetti Provera, CEO of Pirelli and Co-President of the Business Forum Italy-China. – Licia Mattioli, Vice-President CONFINDUSTRIA. 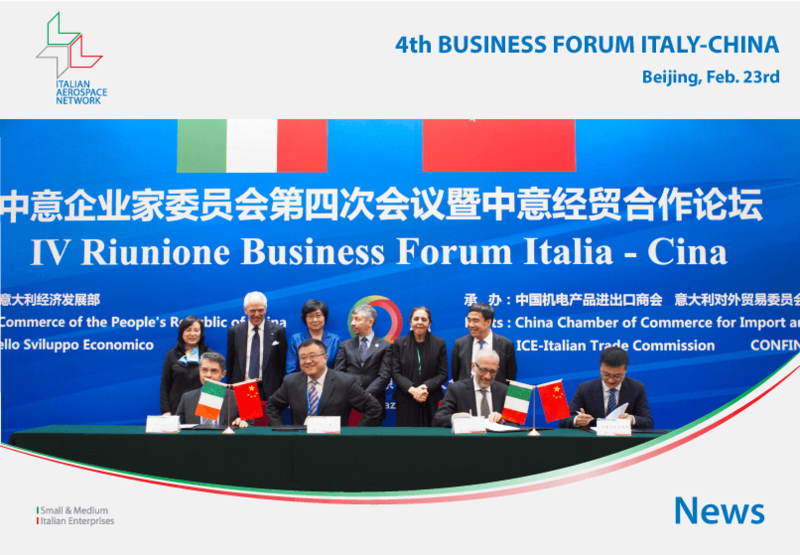 Finally, several cooperation agreements were signed by Italian and Chinese enterprises, witnessed by the two Countries’ Ministries and the Co-Presidents of the Business Forum. IAN signed a strategic agreement with Sino-Italy Ningbo Ecological Park for the development of 10 advanced integrated projects in the field of General Aviation. Get in contact with us may you wish to know more or take part in the advanced integrated projects.